The $437 million jackpot was won on January 1st, 2019 and the ticket holders finally came forward. 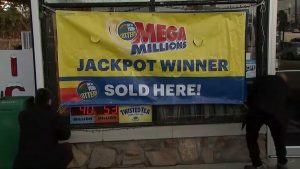 The year started well for the group of 23 co-workers from Long Island who won the Mega Millions jackpot together! Almost two months later, they have collected the prize under the name of New Life syndicate. They opted for the lump sum payout for their Mega Millions jackpot. After paying all the taxes, they were left with $176.1 million. The group decided to remain anonymous. They bought the winning ticket at Brookville Auto Service in Glen Head, and the retailer will also receive a bonus of $10,000 from the New York Lottery for selling the lucky ticket. The Long Island syndicate has an office tradition of playing the lottery weekly, with each member contributing a dollar. One member then is responsible for purchasing the group’s tickets. The winning numbers for the draw were 34, 44, 57, 62 and 70, with Mega Ball 14. They also used to play other major lotteries, US Powerball and New York Lotto. On the first day of the year, they got their big break in the Mega Millions draw! The Long Islanders won one of the biggest jackpots ever offered by this lottery. Two days after the big draw, when they returned to the office and the news spread about the win, they repeatedly checked the winning ticket in disbelief. Although they could just quit their jobs and live care-free, most of the employees chose to continue working, as they view themselves as a family, not simply co-workers. The members of the New Life syndicate plan to invest their money in buying new houses and setting up college funds for their children. Plans to travel the world are also in place! Congratulations to this lucky syndicate!